After Cloudfone’s series teaser photos for their latest Android smartphone they now successfully loaded the launched of Cloudfone Thrill 530qx. A 5.3 inch feature packed phone that comes with a faster quad core processor at 1.2 GHz. To start this post we’ll name all the goodies you can get with this phablet. First is the screen size and type, it has an IPS display which makes the phone shine on any viewing angles and the qHD resolution (950x540) adds more colors on the overall looks. Another good point on this device is the 5.3 inch display, as what smartphone users desired to get a bigger screen to maximize productivity and usage. To continue, the second key specs of Cloudfone 530qx is the internals (RAM, Processor, Storage). This handset sports a quad core processor that plays important part for the phone to render good performance and also a feature that every buyer wants. Same goes with RAM, it has 1GB installed along with 4GB ROM completing the quad combo. The third feature you can benefit with this phone is the camera, all the girls, semi-girls and guys want from a smartphone is have a on the go camera phone that can take good quality photos. Cloudfone Thrill 530qx is on your side, it has a 12 megapixels rear camera with LED plus flash to add more color quality in low light shots. It’s a dual cam guys, you can make use of its 5 megapixels front camera for MEtime shots and video calling sessions using your favorite apps. Fourth and may not be the last is the battery life, Cloudfone is known for giving a good battery bundle to their handsets. If you can recall their hit Cloudfone Thrill 430x, it has a monstrous battery power for 4160mAh on 4.3 inch qHD screen. 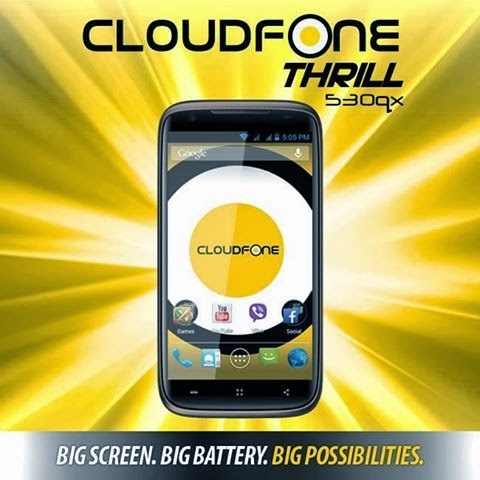 Cloudfone did it again on this Thrill 530qx, it’s powered by a whooping 4500mAh battery life. To all of you guys who are looking for affordable and power packed Android phone do give a try Cloudfone Thrill 530qx and tell us how satisfied you are. We haven’t tested this device yet but the specs sheet itself speaks all your needs for a quad core phone at a reasonable price.